For Breakfast this morning I made some Simply Potatoes Shredded Hash Browns, Heated up some Meijer Diced Ham, fried an Egg Sunnyside Up, made a cup of Bigelow Decaf Green Tea. I made a bed of the Hashbrowns in a bow and sprinkled some Sargento Reduced Fat Sharp Cheddar Cheese. Next I put the Diced Ham over top the Hash Browns then put the Sunnyside Up Egg on to top it off! One delicious Breakfast! Outside partly cloudy and 84 degrees. Took Mom’s car up to be washed and the inside cleaned. Then stopped by the bank. Next took my car up to have it washed and stopped and got gas. Not a lot going on today, watched some College Football. 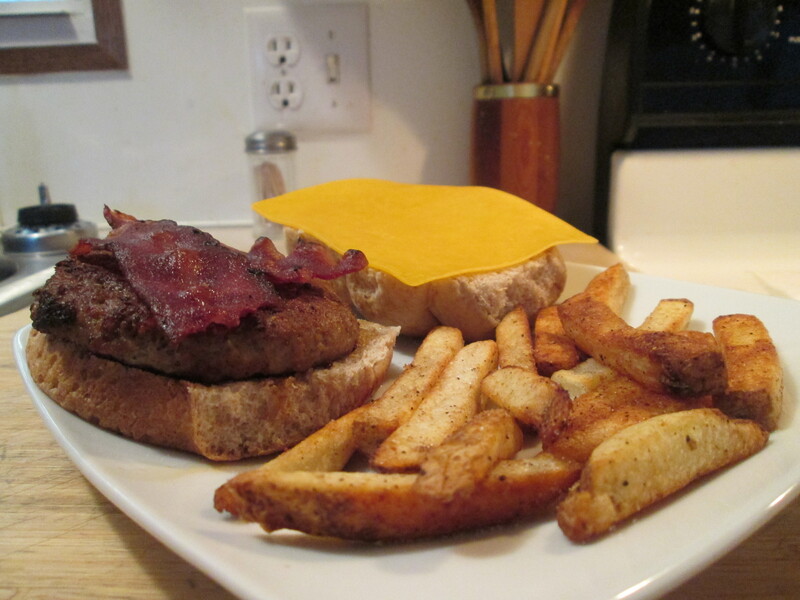 For Dinner tonight a Bacon Blue Buffalo Burger w/ Baked Fries. I’m having another one of the Wild Idea Buffalo – BACON BLUE BURGER. I’ve had a couple of these now and love them! This time I’m adding a couple of slices of Simple Truth Hickory Smoked Bacon. Love these new Wild Idea Buffalo Products. It comes frozen and there’s 3 – 1/3 lb. Burger Patties. The Premium Ground Buffalo is mixed with Wild Idea Buffalo Bacon, Blue Cheese, and seasoning. I’ll be preparing it as I do all Wild Idea Buffalo Burgers. To prepare it I’ll need; Wild Idea Buffalo – BACON BLUE BURGER, McCormick Grinder Sea Salt and Black Peppercorn, Simple Truth Hickory Smoked Bacon (2 slices), Jack Daniel’s Honey Smokehouse BBQ Sauce, and a Aunt Millie’s Reduced Calorie Whole Grain Hamburger Bun. To start it I seasoned it with the McCormick Grinder Sea Salt and Black Peppercorn, lightly seasoned. I then pan fried it, on medium heat, in Extra Light Virgin Olive Oil about 4 minutes per side. Buffalo gets done rather quickly due to it’s so lean. As the Burger was cooking I fried the 2 slices of the Simple Truth Hickory Smoked Bacon. To serve the Burger I grabbed the Bun and added the Burger, topped it with some of the BBQ Sauce, and topped it with the Bacon. Every bite you can taste the Bacon and the Blue Cheese and there was bits of the Buffalo Bacon throughout the Burger. The added Bacon worked great! This Burger is quickly becoming a favorite! Just a flat out excellent Burger! Then for a side I baked some Alexia Organic Yukon Select Fries. Seasoned them with McCormick Grinder Sea Salt and Black Peppercorn Medley. Baked them at 425 degrees for 16 minutes. They bake up beautifully and seasoned just right! Plus they are only 120 calories and 15 net carbs. Served them with a sprinkle of Crumbled Blue Cheese on top. For dessert later a Weight Watcher’s Cookies and Cream Ice Cream Bar. Our 100% prairie grass-fed Premium Ground Buffalo mixed with our 100% Buffalo Bacon, Blue Cheese and just the right amount of seasoning! For additional flavor try it with grape jelly or your favorite preserve – absolutely scrumptious! We did the work for you and… you’re welcome! Three one-third pound handcrafted burgers per package. For Breakfast this morning something a little different, Wild Boar Bacon! I had ordered some from SayersBrook Bison Ranch and just received my order yesterday afternoon. Couldn’t wait to try it so I’m having it now. The slices were not as long as most Bacon Slices, but it made no difference. It fried up as normal Bacon and tasted great! Wild Boar Bacon has a richer taste and is leaner than Pork Bacon. Really enjoyed this and will have it again. Along with the Bacon I prepared some Simply Potatoes Shredded Hash Browns, toasted a slice of Healthy Life Whole Grain Bread, and my usual cup of Bigelow Decaf Green Tea. After Breakfast did a few chores around the house and finished up a load of laundry for Mom. Then after Lunch I went out to the shed and pulled out the rest of the deck furniture and cleaned it up. Rain moved back in again, a high in the 60’s. For dinner tonight I prepared “Not So Sloppy” Buffalo Joes Sliders w/ Baked Fries. It’s Sloppy Joe Night tonight for dinner! A delicious and a super easy meal to make. To make the Sloppy Joes I used a 1 lb. package of Wild Idea Buffalo Ground Round, 1 jar of Hormel Not So Sloppy Joe Sauce, and Kroger Lite Wheat Buns. Using Buffalo, or Bison, instead of Beef will give your Sloppy Joe a deeper and richer flavor. Really looking forward to tonight’s Dinner, been a while since I’ve had these! Using a large skillet to brown the Buffalo in I seasoned it with Morton’s Salt Substitute, Ground Black Pepper, and Roasted Ground Cumin. After the Buffalo was browned and no longer pink I added the jar of Not So Sloppy Joe Sauce stirring and making sure the Sauce and Buffalo was well mixed. Simmer until it’s warm, and served. I love the Hormel Not So Sloppy Joe Sauce. It’s a good thick sauce well seasoned with Spices, Onions, Green Peppers among other ingredients (70 calories and 15 carbs per serving). I served them this time on Kroger 100% Whole Wheat Sliders Mini Buns. Sloppy Joes make a perfect Slider! Another delicious dish using Wild Idea Buffalo. For a side I baked some Alexia Organic Yukon Select Fries. Seasoned them with McCormick Grinder Sea Salt and Black Peppercorn Medley. Baked them at 425 degrees for 16 minutes. They bake up beautifully and seasoned just right, excellent Shoestring Fry! Plus they are only 120 calories and 15 net carbs. For Dessert/Snack later a bowl of Smart Pop – Pop Corn. Not-So-Sloppy-Joe® sloppy joe sauce is as distinctive as its name. Not-So-Sloppy-Joe® sloppy joe sauce has a hint of barbecue flavor and is richer and thicker than other sloppy joe sauces. Since its beginning in 1985, there’s been one very graphic way to show the thick and rich texture of Not-So-Sloppy-Joe® sloppy joe sauce: the “drip test.” When you hold up a sloppy joe made with Not-So-Sloppy-Joe® sloppy joe sauce, there are no drips. It’s that rich and thick. Wild Boar is sometimes referred to as “the wild version of the other white meat.” Replacing traditional ground pork with ground wild boar can greatly increase the flavour of almost any dish. Wild Boar meat tastes slightly sweet and nutty due to its diet of foraged nuts and other foods from the forest. Wild boar is not prone to illness or disease. Our wild boar meat is chemical free without any added hormones. No antibiotics, No steroids, All natural wholesome meat. Stayed up a little late last night watching the terrible and cowardly acts of violence in Dallas. My thoughts and prayers go out to the families of the slain officers and the entire Dallas Police Force. Also my prayers go out to the gentlemen’s family up in Minnesota that was needlessly killed by an officer. The state of this Country is a result of the leadership of this Country. I’ll say no more on that subject. I prepared a family favorite for everyone this morning for Breakfast, Skillet Potatoes and Ham for Breakfast. I used 1 package of Simply Potatoes Steakhouse Seasoned Diced Potatoes and a package of Meijer Diced Ham to prepare it. Just cook the Potatoes according to the package instructions and with about 5 minutes of cooking time left add the Diced Ham. Just love this skillet meal! After Breakfast I ran the vacuum real quick and then outside for a little work. I wanted to try to work outside early before the humidity got too bad, but it was already bad out there earl. I trimmed the vine we have that grows down the side of our driveway. The vine had started to overtake part of the drive. That taken care of stayed in most of the day and got a few little things done around the house. So for Dinner tonight it’s a Dutch Smoked Gouda, Bacon, Pork Burger w/ Baked Shoestring Fries. I seen a video and recipes on Face Book with Pork Burgers and they looked fantastic. So it had been a while since I made Pork Burgers and decided to pick up some Ground Pork while at Kroger yesterday. To make the Burgers I’ll need; 1 lb. package of Ground Pork, Garlic Powder, Onion Powder, Cumin, Mustard Powder, Dried Cilantro Leaves, Shaved Honey Crisp Apple, Simple Truth Hardwood Smoked Bacon, Boar’s Head Smoked Gouda Cheese, and Healthy Life Whole Grain Hamburger Buns. I first fried my Bacon. I used Simple Truth Hardwood Smoked Bacon. Using a large skillet, I fried the Bacon until crisp. Removed the Bacon and placed it on a plate and set aside. With a 1 lb. package of Ground Pork you can easily get 4-5 Burgers. To make them I got a large bowl and added the Pork. I then added all the Spices; Garlic Powder, Onion Powder, Cumin, Mustard Powder, Dried Cilantro Leaves. I mixed the Spices with the Ground Pork until well mixed. Don’t overwork the Pork, you don’t want to break the Pork down. Next just form the Pork Mixture into Burgers. To cook the Burgers I’m using a large Cast Iron Skillet. I first sprayed it with Pam Cooking Spray and added 1 tablespoon of Extra Virgin Olive Oil, heated the Skillet on medium heat. When the Skillet was heated up I added my Burgers. After 3 minutes flip the burgers. Continued cooking for 6-8 minutes more. Flipped one more time, cover and cook for another 3-4 minutes or until cooked through. If you’re adding on cheese, go ahead and do so about a minute before removing from them pan. I’m using Smoked Gouda Cheese. When cooking Pork Burgers, you want to make sure that they are cooked all the way through. Which means taking them to 160 degrees internally. I served the Burgers on Healthy Life Whole Grain Hamburger Buns. The Burgers were topped with Shaved Apple Smoked Gouda Cheese, Boston Bib Lettuce, Smoked Bacon, and Hellman’s Lite Mayonnaise. We have us a Burger!! All the Spices have given the Burger fantastic flavor. Then with the added Shaved Apple, Mayo, Bacon, Lettuce it made it perfect. Love these Burgers! Then to go with Burgers I baked some Alexia Organic Yukon Select Fries. The more I have these the more I’m liking them! Seasoned them with McCormick Grinder Sea Salt and Black Peppercorn Medley. Baked them at 425 degrees for 18 minutes. They bake up beautifully and seasoned just right, excellent Shoestring Fries! Plus they are only 120 calories and 15 net carbs. For dessert later a Skinny Cow Chocolate Truffle Ice Cream Bar. A little about my favorite meat, Buffalo….. Although buffalo meat is similar to beef, it needs to be handled and cooked differently. The important things to remember are, do not overcook, and, do not let the meat dry out. Kitchen Hints of the Day! * Once the package is open, tightly wrap or put unused bacon in an air tight container for up to 7 days. * To freeze unopened bacon, overwrap the store package with heavy duty foil or other freezer wrapping, being sure to push all the air out of the package and tightly close the wrapping around the inside package. Use within 1 month. * Thaw frozen bacon in the refrigerator. Do not defrost in the microwave or cook from frozen. * Store cooked bacon in a plastic bag in your refrigerator up to 5 days. Hint #1 – If you start bacon cooking in a cold pan, it will reduce shrinkage. Hint #2 – Sliced bacon will only stay fresh for 1 week under refrigeration once the package is opened and the bacon is exposed to air. Well they were right when they said it would be cooler! Rolled out to get the Morning Paper and the old unofficial Outdoor thermometer said 38 degrees and with the cool breeze that was blowing it felt a bit cooler than that. But I love this weather! It was a beautiful Autumn Day out, sunny and cool. For dinner tonight I prepared a Cheddar Bacon Turkey Burger w/ Baked Fries. 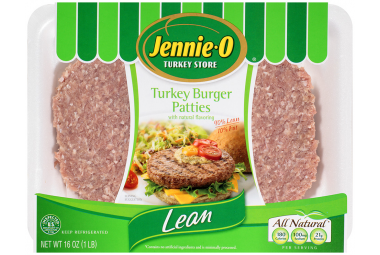 While at Mejier last week I had picked up some Jennie – O Turkey Burger Patties (Lean). I had one for dinner last week and it was so good I decided to have it again for dinner tonight. Easy to prepare and only 180 calories and 9 g fat and already made into patties. Pan fried it in Canola Oil about 17 minutes, flipping three times. While the pattie was frying, in another skillet I fried up some Jennie -O Turkey Bacon, another low calorie and lean Jennie – O Turkey Product. The bacon is only 30 calories, 0 carbs and .05 g fat. I served the burger on an Aunt Millie’s Reduced Calorie Whole Grain Bun and topped with a slice of Sargento Reduced Fat Sharp Cheddar and a slice of Turkey Bacon. Love these Burgers! For a side with my burger I baked some Ore Ida Simply Cracked Black Pepper and Sea Salt Country Style Fries. Served these with a side Daisy Reduced Fat Sour Cream. For dessert later a Healthy Choice Chocolate Swirl Frozen Yogurt. Spray skillet with nonstick cooking spray or add 1-2 teaspoons of oil. Preheat skillet over medium-high heat. Place burgers patties in hot skillet. Cook approximately 15 to 17 minutes, turning occasionally (2-3 times). Always cook to well-done, 165°F. as measured by a meat thermometer. Spray grill rack with nonstick cooking spray. Place burger patties on grill rack 4 inches from heat source. Grill approximately 15 to 17 minutes, turning occasionally (2-3 times). You can take the potatoes out of the country. But you can’t take the country out of our delicious Cracked Black Pepper and Sea Salt Country Style French Fries. Simple ingredients like potatoes, olive oil and sea salt – simply prepared. That’s Ore-Ida style. baked beans are made from haricot beans, also known as navy beans – a variety of Phaseolus vulgaris in a sauce. In Ireland and the United Kingdom, a tomato and sugar sauce is most commonly used. They are commonly eaten on toast or as part of a full English breakfast. In the United States there are multiple styles. Boston baked beans use a sauce prepared with molasses and salt pork, the popularity of which has led to the city being nicknamed “Beantown“. Beans in a tomato and brown sugar, sugar or corn syrup sauce are a widely available type throughout the US. Maine and Quebec-style beans often use maple syrup. Canned baked beans are used as a convenience food, shortening cooking times for a meal, or may be eaten straight from the can, in camping or emergency settings, as they are fully cooked. They are sometimes served with chips, waffles, or the like. The beans used to make baked beans are all native to North America and were introduced to Italy in 1528 and to France by 1547. The dish of baked beans is commonly described as having a savory-sweet flavor and a brownish or reddish tinted white bean once baked, stewed, canned or otherwise cooked. According to alternative traditions, sailors brought cassoulet from the south of France or northern France and the Channel Islands where bean stews were popular. Most probably, a number of regional bean recipes coalesced and cross-fertilised in North America and ultimately gave rise to the baked bean culinary tradition familiar today. While many recipes today are stewed, traditionally beans were slow baked in a ceramic or cast-iron beanpot. A tradition in Maine, USA, of “bean hole” cooking, may have originated with the native Penobscot people and was later practiced in logging camps. A fire would be made in a stone-lined pit, allowed to burn down to hot coals and then a pot with eleven pounds of seasoned beans would be placed in the ashes, covered over with dirt and left to cook overnight or longer. These beans were a staple of Maine’s logging camps, being served at every meal. In the UK, Ireland, Hong Kong and Singapore the term baked beans refers almost exclusively to canned beans in a tomato sauce. Many people regard baked beans as an integral part of the modern full English breakfast, including beans on toast. Every day 2.3 million British people eat Heinz Baked Beans; 1 million of those people eat them for dinner. Although Heinz Baked Beans have long been the biggest selling brand, other brands such as Branston Baked Beans, supermarket own brands, and HP baked beans (later purchased by Heinz), are available. Heinz baked beans were first sold in the UK in 1886 in the upmarket Fortnum & Mason store in London as an exotic import at a high price. Although they are now a staple food, the store continues the tradition of selling Heinz Beans among its more expensive wares. Baked beans are also considered to be a staple food of students, as they are typically easily heated in a microwave and are very cheap. Metropolitan Australian and Kiwi cafes typically serve beans in a tomato sauce prepared freshly rather than canned, as the provision of canned food would be considered odd in an eating establishment. These are made with crushed tomatoes (which may or may not be peeled), smoked hock of ham, onion, garlic, and assorted spices. The beans may be of haricot, navy, borlotti & cannellini varieties. UK-style tinned baked beans are also popular for home consumption due to the quick preparation time. Wattie’s Baked Beans are considered a cultural icon for New Zealanders. In the United States, Bush’s (Bush Brothers and Company), Van Camp’s, B&M (Burnham & Morrill Inc.), Allens, Inc., the H. J. Heinz Company, and the Campbell’s Soup Company are well-known producers or brands of packaged baked beans. B&M specializes in Boston-style baked beans often sold in beanpot shaped jars, and canned brown bread, a traditional regional accompaniment to baked beans; whereas Bush and Van Camp produce multiple flavor varieties of canned beans, some styles using cured bacon to add its flavorings to the products. 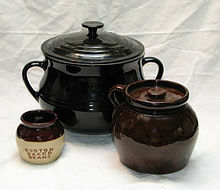 Three beanpots used for cooking homemade baked beans. and are traditionally cooked with salt pork in a beanpot in a brick oven for six to eight hours. In the absence of a brick oven, the beans were cooked in a beanpot nestled in a bed of embers placed near the outer edges of a hearth, about a foot away from the fire. Today, baked beans can be made in a slow cooker or in a modern oven using a traditional beanpot, Dutch oven, or casserole dish. In southern states and along the eastern seaboard of the US, the beans become tangier usually due to the addition of yellow mustard. For example the baked beans of Tennessee based Bush’s include mustard in most of their varieties of beans. Ground beef may also become common alongside bacon in the home versions some of these bean styles. They may take on a flavor similar to Cowboy Beans, a home mixed stew, somewhat similar to a chili but made instead with sweet baked beans. Heinz baked beans became very successful as an export to the UK, where canned baked beans are now a staple food. In America, the H. J. Heinz Co. continue to sell baked beans, however, they are not always as widely distributed as competing American brands. 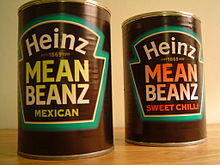 Despite their international fame, there are currently substantial differences between the Heinz baked beans produced for the UK market (descended from the original American recipe) and the nearest currently equivalent American product (Heinz Premium Vegetarian Beans). The American product contains brown sugar where the British beans do not, and the US product contains 14g of sugar per 16 oz tin compared to 7g for the British version (equating to 140 vs 90 calories). The US beans have a mushier texture and are darker in color than their UK counterpart. This has resulted in a situation where the product is now imported back to the brand’s home country. For several years, the UK Heinz Baked Beans have been available in the US, either in different sized cans from those sold in the UK or in a 385 gram can (the same can as the 415 gram can in the UK) with an “export” label with American English spelling and the word “baked” dropped from the title on the label. These are sold in many US specialty stores, such is the popularity of baked beans and their appeal to expats. Bush, Van Camp, B&M, and Heinz all produce pork-free baked beans labeled as vegetarian beans, making this American dish available to people who abstain from pork for religious, dietary, or ethical reasons. Home made Polish baked beans fasolka po bretońsku. * In Iran, Loubia Garm (Hot Beans) is prepared using beans in a tomato sauce, often served in winter on stalls in streets. 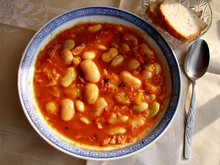 * In Poland, with the addition of bacon and/or sausage these are known as Breton Beans (fasolka po bretońsku). * Frijoles charros, pinto beans cooked with bacon and sometimes tomatoes, are popular in Mexico and the American border states. * In the Italian cuisine beans (of various size and various types) are widely used for several recipes also mixed with other ingredients: “fagiolata” generally stands for baked beans but there are also regional variations like “fagioli alla uccelletto” in Florence; “minestra di fagioli” (beans soup normally cooked with vegetables) “pasta e fagioli” (meaning “pasta and beans”). * Quebec-style baked beans are often prepared with maple syrup. * British cuisine claims beans on toast as a teatime favourite, the combination of cereal and legume forming an inexpensive complete protein; compare rice and beans. 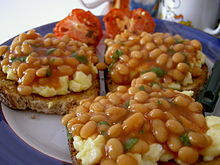 Variations of “beans on toast deluxe” can include extras as such as egg, grated cheese, marmite, tuna etc., and baked beans sometimes form part of a full English breakfast. * Beans cooked in barbecue sauce (or a similarly flavoured sauce) are a traditional side dish in an American barbecue. * “Franks & beans”, a recipe wherein hot dogs are cut up and cooked in the same sauce as the baked beans. In Canada, this recipe is more commonly called “beans and wieners”. * In Mexico and Latin America baked beans are also popular: black beans (frijoles negros) and frijoles pintos (pinto beans) are the most common. * In the Balkans, they are known as prebranac. * The traditional Jewish Shabbat dish cholent (also known as hamin) is made with meat, potatoes, beans and barley. * Many unusual dishes are made with baked beans including the baked bean sandwich. These are slices of bread topped with beans and other additions, such as melted cheese. In 2002 the British Dietetic Association allowed manufacturers of canned baked beans to advertise the product as contributing to the recommended daily consumption of five – six vegetables per person. This concession was criticised by heart specialists who pointed to the high levels of sugar and salt in the product. However, it has been proven that consumption of baked beans does indeed lower total cholesterol levels and low-density lipoprotein cholesterol, even in normo-cholesterolaemic individuals. Some manufacturers produce a “healthy” version of the product with reduced levels of sugar and salt. It’s getting harder and harder to watch the news anymore, regarding the ever declining status and condition of our Country. But I’m not going to use this blog and get all political. Hot and a little humid today, high in the 80’s. I’m not real hungry and not real motivated today so I went with something real easy to prepare, Sea Pak Shrimp and Grits with Cheese and Bacon. 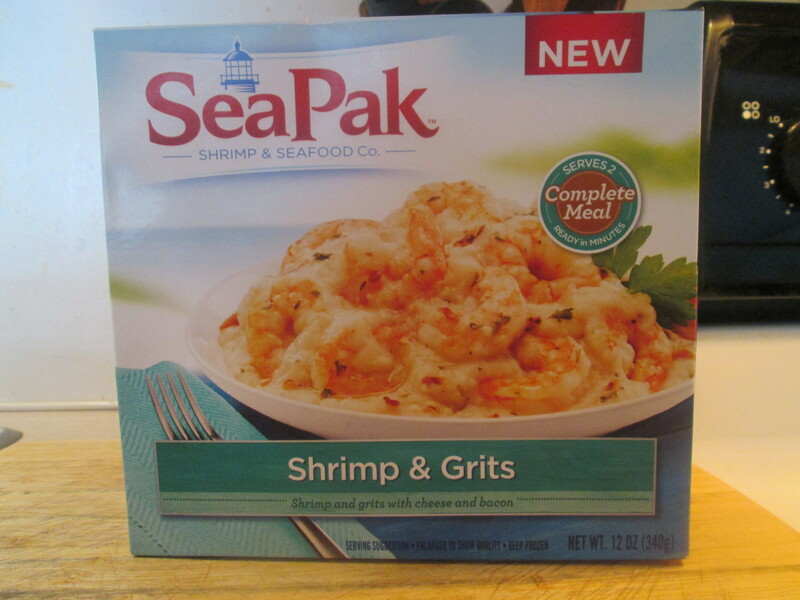 I came across this the other day at Walmart, It’s new from Sea Pak Seafoods. It looked and sounded good so I thought I would give it a try. Easily prepared, I just emptied the entire contents of bag into a 10″ skillet and arranged shrimp in a single layer. Added 1 cup of water to the skillet with shrimp and grits. Heated the skillet on high heat. When the sauce boils (about 5 minutes) turn down to low heat and cover. Continued cooking for an additional 8-10 minutes, stirring occasionally, until shrimp was fully cooked and the water is absorbed by the grits. Removed from heat and let stand 2 minutes. You can make the grits creamier by adding 1-2 tablespoons of additional water and cook an additional 2-3 minutes. 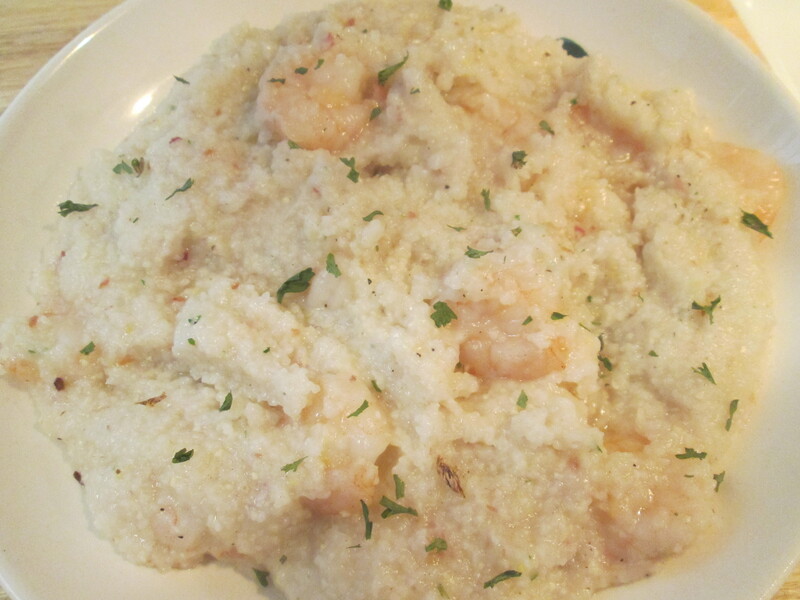 Quick way to have some Shrimp and Grits! Everything was nicely seasoned and really loved the grits! Wish the Shrimp was a tad larger but overall really enjoyed it. It was 250 calories and 32 carbs for a serving and there’s two servings per box. I’ll keep a box or two in the freezer. For a side or appetizer I had the Dill Pickled Carrots i had made the other day. They turned out delicious! The Dill and Brine just loaded the Carrots with flavor. Very good recipe, a keeper! For dessert later a bowl of Breyer’s Carb Smart Vanilla ice Cream topped with some Del Monte No Sugar Added Peach Slices. Delight your dinner table with a Southern staple by serving up our new Shrimp & Grits. Your family will enjoy our tender shrimp and home-style grits, complete with an extra helpin’ of cheese and bacon. Mmm. Empty entire contents of bag into a 10″ skillet and arrange shrimp in a single layer. Add 1 cup of water to the skillet with shrimp and grits. Heat skillet to HIGH heat. When the sauce boils (about 5 minutes) turn down to LOW heat and cover. Continue cooking for an additional 8-10 minutes, stirring occasionally, until shrimp are fully cooked and the water is absorbed by the grits*. Remove from heat and let stand 2 minutes, then serve. *For more creamier grits add 1-2 tablespoons of additional water and cook an additional 2-3 minutes. Empty entire contents of bag into a 1 quart microwavable bowl. Add 1/2 cup of water to bowl containing shrimp and grits. Microwave on HIGH for 7-8 minutes, stirring occasionally. Cover bowl and let stand for 3 minutes and serve. Due to differences in appliances and quantity prepared, cooking time may vary and require adjustment.